It is my pleasure to update you on a few exciting bits of Apeiron news. The first is issue 9 is on it’s way and it will be new, improved, and better than ever (there may even be the option for turning real pages, but that will be revealed later). We had an excellent team of slushers reading your work and loving it. We shortened our submission period, you may have noticed, and it helped to ease the wave of submissions. Although, we still had a high volume of work come in considering there were two fewer weeks! So, thank you, all of you, who submitted. We are reading every day; keep checking your in-boxes and spam folders. And now, the most exciting news of all: Apeiron Review has an intern!! (Hold your applause till the end). We’d like to introduce to you Tiara. 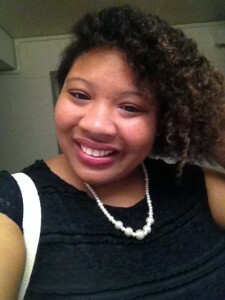 She is an English and Creative Writing student at Rutgers University- Camden. Most recently, two of her stories were published in Crab Fat Literary Magazine, and she is the newly appointed Assistant Editor of Whirlwind Magazine. Tiara is a writer who has experience teaching creative writing in South Jersey. In addition to writing she enjoys dancing and reading things that make her think. She will wear many hats while working with us, one of which includes generating original content for the site (I’m not sure if that would mean she’ll don a baseball cap or trilby; she’d look good in a trilby for sure). Tiara will be out and about in the Philadelphia area reporting on literary events in her own fashion. Her first article will be posted very soon, so be on the look out. We are excited to have her. We’re sure you will enjoy reading her articles and commenting on them. We look forward to many interesting discussions and all that Tiara has to offer our magazine.